SAN FRANCISCO — Jake Peavy went out of his way after Friday night’s win to tell reporters how much he respected the way the Phillies play the game. It sounded like a nice compliment. It ended up being a warning. The Phillies came back to tie Sunday’s game three times, but Conor Gillaspie walked them off in the ninth. With the 8-7 win, the Giants, not the Cubs, became the first National League team to reach 49 wins. The Giants jumped out to a 5-1 lead when young Aaron Nola completely lost his command. Nola hit back-to-back hitters in the third (he hit three in 3 1/3 innings) and also gave up five hits as the Giants put up a four-spot. Johnny Cueto was cruising, with the Phillies reaching base just once until there were two outs in the fourth. That’s when Cueto appeared to get revenge, drilling Maikel Franco with a fastball. The wheels came off from there. A walk and two singles put two runs on the board in that inning and Cueto gave up two more in the fifth. Brandon Crawford’s RBI single put the Giants back on top in the sixth, but as they have done all weekend, the Phillies fought back. Odubel Herrera opened the seventh with a solo homer to center. Angel Pagan’s fourth hit was a double off the wall in the seventh that gave the Giants the lead, but the Phillies again punched right back, tying the game against Josh Osich in the top of the eighth. Ramiro Pena hit a high fly to right with one out in the ninth and it dropped into the corner for a double. Gillaspie followed with a shot down the line. Starting pitching report: On Saturday night, the Phillies became the first team since April 15 to put more than two earned runs on Madison Bumgarner’s line. A day later, they became the first team since May 2 to do the same to Cueto. The right-hander gave up six earned in his six innings. Bullpen report: Cory Gearrin is having an underrated season. He worked around two singles in the ninth, lowering his ERA to 2.16. At the plate: Pagan had his ninth career four-hit game and fifth as a Giant. He’s batting .355 since coming off the DL. 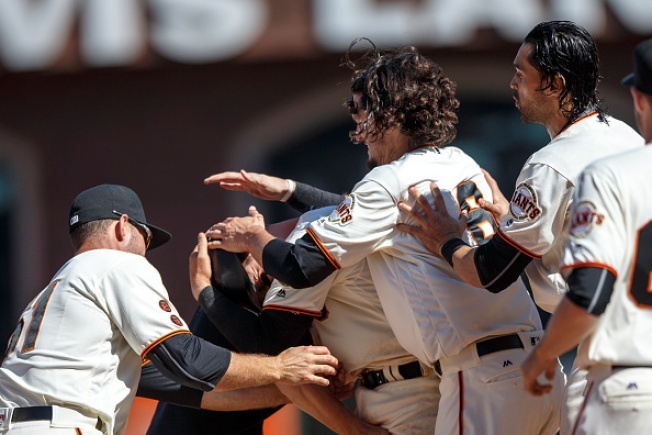 In the field: Brandon Belt made a diving stop on Cesar Hernandez’s grounder in the fourth and then backhand-flipped the ball to Cueto for the third out of the inning, saving at least one run.